Estudillo Dental has built a reputation in the San Leandro community based on 25 years of outstanding dentistry. Dr. Victor Drabkin and his professional team provide state-of-the-art dental treatment that is focused on your individual needs and goals while maintaining a comfortable, friendly environment. Your overall well-being and happiness is our main objective, so we’ve dedicated ourselves to ensuring that your smile and health exceed your expectations. You deserve a healthy, beautiful smile you’ll be proud to show off. 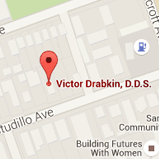 Contact our San Leandro dental office to schedule your complimentary consultation with Dr. Drabkin today. Providing quality dental care including dental implants, mini implants, teeth whitening, veneers and cosmetic dentistry to San Leandro and all surrounding California areas.